This app does not let you edit or add items to the blackboard. What is the point for instructors to use this if we cannot do anything. This is false advertising and I am highly disappointed. I am afraid this app is useless. Does not even work. I don't see any of my classes listed. Would you please add support to better view and respond to emails? 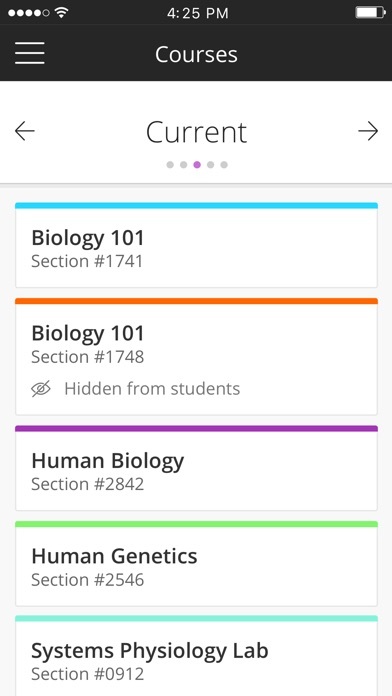 This app claims to be for instructors, yet: - it does not allow you to grade assignments. 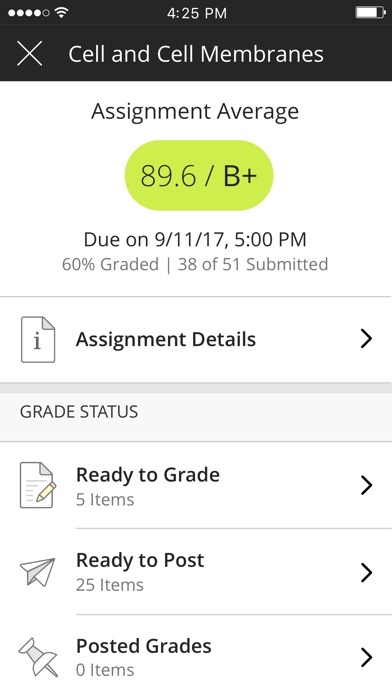 - there is no equivalent to the “full grading center” page, and so there is no way of seeing all of a student’s (or all students’) particular grades. I can log in (sometimes), but I can’t access any assignments to grade—not even the limited subset of ones I’m supposed to be able to access. This wouldn’t be such a crushing disappointment in working in Blackboard in a web browser on Safari on iPad weren’t such an exercise in skull-crushing frustration. Why, dear school district, whyyyyy must we use this sub-par platform!?!?!? Other reviews have pointed to the inability to grade. I don’t care about that. What I cannot do is create or edit assignments or even rearrange them for easier student access. Often, these are notes I get about student confusion. I want to quickly fix them but I have to get to an actual computer—even for a minor tweak. FAIL. FAIL. FAIL. Can’t view/edit grades, can’t add resources, can’t [insert whatever you want to do as an instructor other than make announcements]. When using Tools, the user is sent to the website, making this more of a portal, not a well-functioning app. And we all know how poorly the Blackboard website functions with iOS, hence the need for a well-functioning app. Just read the title of this review and carry on. I am excited that the grading feature has been added to the app. This is a very useful app. Thanks! Instructor can’t do anything! I don’t need to view my content - I need to view my grade book, grade papers, adjust grades, take attendance. This is worthless! So many 1 stars how the hell does it have a 3.1 overall rating? Terrible, terrible app. 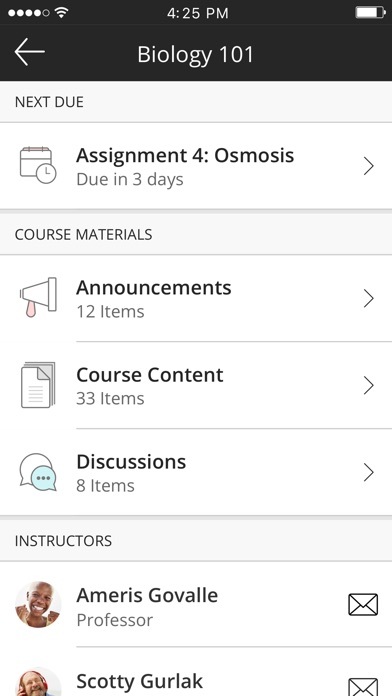 Please let us know when you get serious about this, because it would be nice to have an app that will let us record grades and navigate through the various parts of a blackboard course. I had high hope for this app, but it seems to be a read-only app. I can’t create any new content. My students tell me they like the student version of this app, but the instructor version is useless. Each link simply brings you to a non-mobile version of the Blackboard website. I would love for this product to be functional, as I prefer to work from my iPad or phone. Developers, please read all the comments, pleading for a functional product. I don’t understand how this is a passable replacement for the old Blackboard App. It may be an isolated case, but after reinstalling multiple times and checking back in after a year, this app still does not work properly. It does not display any information other than my name; not displaying my enrolled courses, not displaying my organizations, and not displaying my grades. I don’t know how much money Blackboard gave my instructors to recommend this application, but this defunct app should be disavowed until the developers fix it so that it actually fulfills it’s purpose. I really need something that allows me to grade quizzes, exam essays, and discussion board postings on an iPad. This app does none of those things. How a company that is raking in millions of dollars in profits each year can release an app without any of the functionality that instructors demand is unimaginable. On top of that, there is still no way to access a course grade book and (thanks to how Blackboard is set up) incredibly difficult to do from the web browser on a mobile platform. If Blackboard spent 1/10 of the money that they do on promotions (such as the free lunch they provided for the faculty at my institution) actually developing their products, they might have something that is both functional and pleasant to work with. Instead what we get is a ineloquent product and a half-baked app. I like being able to work from my phone. As an instructor, it’s limited in what I can do but the access is great. would like for it to show replies that are new like the desktop version. You need to add a messaging function and show what students are in the class. This app needs a lot of work to be user friendly. App is useless. It points to an immobile version of BB website. Can’t scroll through grades and view student performance. Many many other shortcomings. Horrible waste of time! As other reviewers have said, this app is useless for instructors without a grading function. Blackboard is ridiculously cumbersome to use online, but the app is enitrely useless. The company should be embarrassed. Note that some of the 5 star reviews here have comments like “2cool 4school”. Perhaps they are embarassed and rated their own product to avoid a 1-star average? This app is useless. I can’t even view grades on it!!! When is this going to be addressed? If this can’t be fixed, they just need to focus on making the mobile site functional!!!!!!! When I’m choosing a number in a rubric that has a range, I can’t choose every number, which is very frustrating and causes me to grade again on a computer. Please fix this! Thanks! The one positive I can say is that it doesn’t appear to be buggy. That said, the functionality is essentially nonexistent so there aren’t any functions for there to be bugs in. I just want to be able to input grades from my iPad, but this is worse than useless. Don’t waste your time with this app. Hopefully blackboard will eventually make a functional version of this app. No grade functionality, no email functionality other than being able to email myself(?). What’s the point? This app is just one more example in a long, long list of why Canvas and other LMS platforms are dominating the market and Blackboard is on its way out. Just a real garbage app. Seriously, what is the point of this app? It has ZERO functionality. I actually laughed out loud when I saw I couldn’t enter—much less even see—grades. App immediately deleted. I posted an announcement and none of my students received it. The features of the this seem to be so limiting that is renders it useless. Can’t grade tests. Can’t grade forums. What’s the point of this app again? What is the purpose of this app? I downloaded it on the advice of our Blackboard rep, who said it had been much improved this month. I still can’t view my grades or grade, and outside of posting a response in the discussion board and viewing my content, this app is pointless. Anyone who has attempted to grade anything on an iPad knows how frustrating/near impossible this is. The menu is constantly disappearing, the slider in the grades works only after much tweaking with settings. Argh. Blackboard has been a leader in the LMS world and they still do not have a good mobile app for either students nor professors. They had a partnership with Agilix back about 10 years ago and they had an incredible product called Backpack. This was not only forward thinking, but it was a decade ahead of the competition. They got into a spat with Agilix and they parted ways. This application demonstrates that there is no forward thinking. For a company this size, if this is the best that they can do...then I question where they will be in 5 years. This is a useless application and I would advise looking at Canvas or Schoology. ...but, as usual, Blackboard destroyed them. 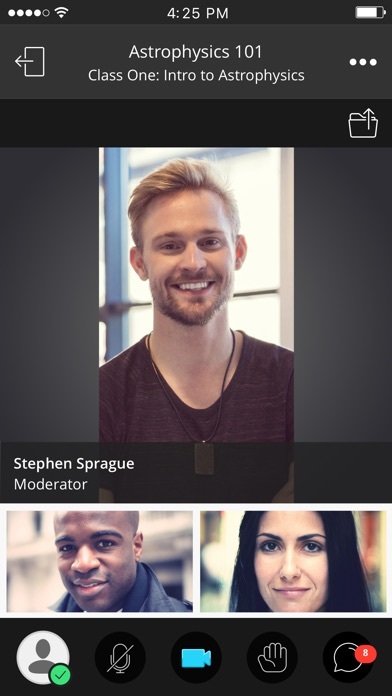 This is NOT the instructor app. I barely see what a student would see. Just to create an announcement, I have to endlessly click on buttons. And there is nothing that allows me to read and grade assignments—not even discussion boards. When I clicked on the latest assignment, which students were to complete in groups, the app took me to Blackboard’s web page. Well, if I wanted to go to the website, then I wouldn’t have tried using the app. Save your time and sanity. Don’t download this app. I wish my college would use another LMS, but, alas. I downloaded this while at a conference so I could input exam grades using my phone because the website doesn’t work well on my phone. I couldn’t do it! What??? Absolutely worthless app for instructors; the functionality of it doesn’t allow instructors to do much other than post announcements and posts in discussions. Can’t edit assignments, make items/assignments available etc. The app should function just like the website does. I am really trying to figure out the purpose for Blackboard creating this app. I can’t grade my assignments. I can’t view my grade book. Oh, but I can send out announcements. That about it. It really seems to be a product of an engineer who has never spent a day in the classroom as a faculty member. This should be removed from the App Store. It has no utility. This app crashes when I try to view my discussion boards. You cannot see grades or add grades. You cannot add content or change content. It is their regular blackboard, but will much less functionality. I’m not sure it was actually made with instructors in mind. This has got to be the most useless app I have ever used. I can do more from a browser on my mobile device than I can from this app, which impressive, considering I can’t do anything useful from a mobile browser either. If it wasn’t for the college using Blackboard, I would never touch it again. Canvas is far better (and it’s not great). I would rate zero stars if I could. I was expecting more out of this app. I can’t even grade assignments with it. Very limited functionality. I’d recommend just using your web portal. The gradebook does not open in the mobile App or using my mobile device outside of the app. Not functional. Not happy. Please fix. There is so much missing functionality in this app that if the regular site wasn’t that awful to use on a mobile device, I would never use the app. Basically, besides checking messages and responding to questions posted in the general discussion area, you can’t do anything else. Can’t see your group area and discussion boards, can’t grade or see the gradebook or any other meaningful instructor tool. This app is essentially useless. The only thing you can do is send email to students and view your own syllabus/content. Without the ability to meaningfully edit content and to grade student work, there is little practical use for this app. 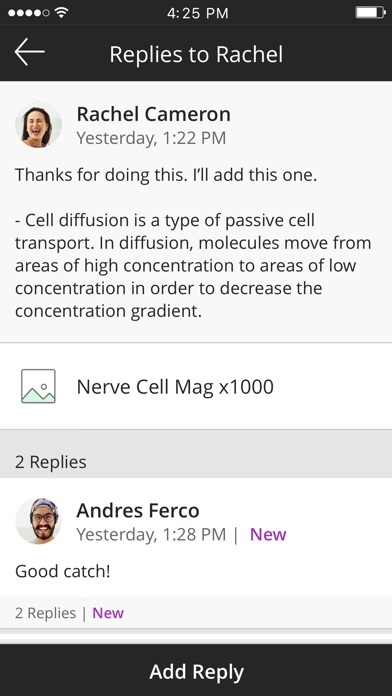 It does not even have notification capability so I can't use it as a notification system for student questions posted to the course discussion board. Useless. There’s nothing else to say. 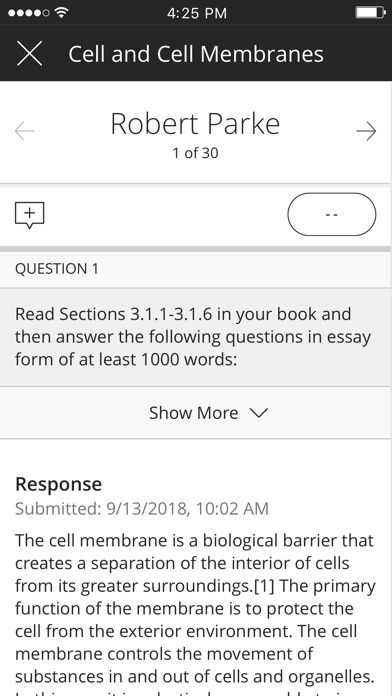 I would like to be able to read my students’ discussion board posts while I’m on the train, but because I use the setting that requires students post first before they can see others’ posts, I CAN’T SEE THEM EITHER. How does this make ANY sense? I agree with the other reviewers-this app lacks the basic functionality an instructor needs on a mobile device. I cannot believe this app cannot be improved. Big disappointment. I use my iPad at work to preserve the hard drive in my laptop, so I was quite disappointed to see that Bb does not operate properly on mobile browsers. 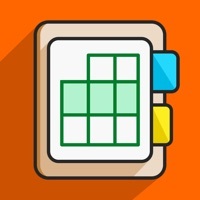 The app is just as useless, since embedded rubrics are not visible, and the Grade Center displays vertically, not in the spreadsheet version on desktop and laptop computers. There once was a time when I could display the Grade Center in screen reader mode via a regular browser. Why can’t you just go back to this simple and user friendly method? 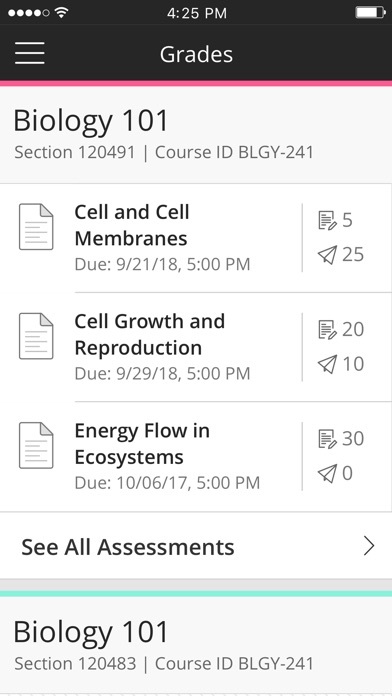 This app does not allow you to view students grades or manage grades, it only gives the option to view course content, see announcements, and email myself. Totally absurd that this app was even made, blackboard has wasted my time. Very disappointed. How can you call this app as blackboard app for instructor? This application has been useless to instructors since it was first released. Now, with the latest update, the “claim” is that you can grade within the app which is a out and out lie as you can’t and when you go to help, Blackboard tells you that grading is not yet available for virtually everything an instructor would want to grade. How about you just stop pretending that is app is useful at all and give us something we can actually use.